For 20 years William Forsythe was the director of Frankfurt Ballet, where he created a series of highly technical, determinedly experimental and undoubtedly demanding works that exhilarated as many dancegoers as they alienated. His critical reputation was stronger than his appeal to the opera house audience, and he was ousted in 2004. Since 2005, he has directed his own company, smaller in scale but no less searching in scope. On the surface, his current double bill might look like a retrospective glance over his own career: the short opening piece, N.N.N.N., is from 2002, one of the last works for Frankfurt Ballet; and the new Study #3 is a compilation of snippets from 27 works dating back 30 years. 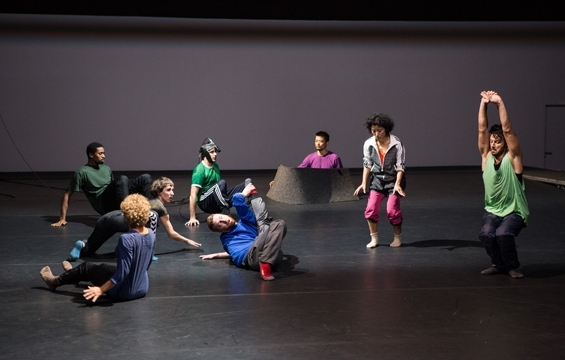 But as the evening plays out, a more rigorous, impersonal logic comes to the fore: this programme is about connecting not dance with music exactly, but movement with sound. In the starkly staged N.N.N.N., a male quartet, the sound comes directly from the dancer’s bodies. At the start, Double Bill Amancio Gonzalez plops his right hand onto his left wrist, swings it up onto his shoulder, then lobs it onto his head, the soft impacts all audible in the silence. Soon the effect is amplified by the others (Fabrice Mazliah, Cyril Baldy and Ander Zabala), flap-slappy pals who join in off-the-cuff flurries and pat-a-cake games, partnered as much by their own errant limbs as by each other. As this choreographic machinery evolves into something resembling a composite organism, more lifelike, the dancers start up an accompaniment of huffs, blows and wheezes as they lock arms, sweep the floor, or peel limb from limb as if they were sticky with Velcro. These body pats and breathy puffs generate the soundtrack for Forsythe’s fascinatingly oddball composition of tics, triggers, loops and slips – part high-concept choreographic mechanism, part low-key slapstick. Study #3, for the full company of 17 dancers, takes a different tack. Like N.N.N.N., the dancers are in random tops and trackies, the stage bare and brutal, but here the sound comes from a succession of dancers standing at an upstage microphone and speaking – or, more often, making incomprehensible noises that sound exactly like speech, right down to details of phrasing, accent and intonation. On the body of the stage, in singles, pairs and groups, the dancers move with such astonishing articulation, fluency and eloquence that you start seeing dance as a kind of speech, and vice versa; and all without understanding a word. There is the babbling, back-andforth conversation of small groups, full of physical gestures, statements and interruptions. In Riley Watts’ soaring backwards leaps, in his wonderfully unpredictable pirouettes – giddying vortices that twist and turn yet always stay exactly on axis – and in David Kern’s seriocomic parody of classical mannerisms, you sense the underlying lexicon and vocabulary of ballet, but transfigured by shifts of accent, odd phrasing and kinetic neologisms. The other correspondences set up – between birdsong and rich rivulets of motion, between insect buzzes and jointed jitters, between the wayward noises of Thom Willems’ electronic score and the bewitching flair and amazing detail of the choreography – then come to seem as communicative and as ungraspable as languages without words. Study #3 certainly provokes a Forsythean mix of exhilaration and alienation. It is more like an extended study than a piece: it feels studious, and you certainly have to work at it. In short, it’s no playtime, but it also has moments of strange alchemy that come upon you like flashes of insight, when nothing makes sense and yet you sense everything: the form, the flesh, the feeling.